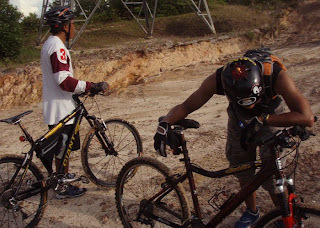 Today Afternoon (4:14pm) was another offroad riding at McFarm. 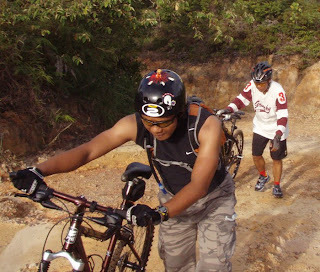 This time kami mencuba trail yang tembus ke Kg Jerudong. 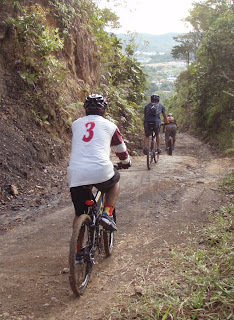 This trail is not for beginners. It's extreme and banyak bukit yang tinggi tinggi. 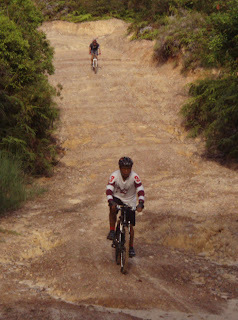 We lost count the number of hills. After the 4th hills, kami surung saja naik bukit. After coming out of the jungle, we decided to go back to our cars at Mcfarm using the main road. inda kami sanggup masuk semula ke dalam hutan. malam karang keluarnya. 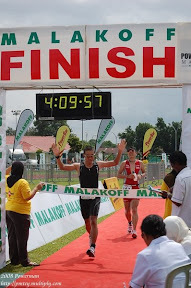 Altogether we managed to cover 28.30km in 2:23:26 hours. In the jungle, the distance was around 6km and it took us around 1 hours to finish the trail. we reached our cars around 18:45pm. 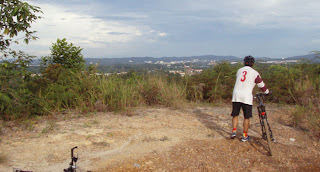 From the Google Map, I can see that there is another trail from McFarm to Kg Perpindahan Katok, Kg Mata Mata Gadong. Maybe we should try to explore the trail if it still exist.